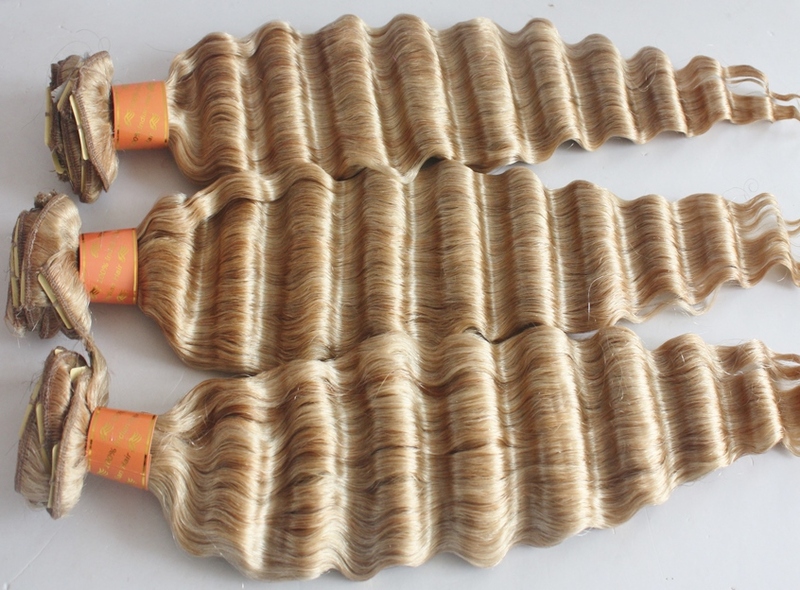 Deep wave clip on hair extensions have a sharp and prominent wave pattern. ...There isn’t a spiral in sight. Blending your natural hair with clip in extensions is crucial when aiming to achieve an authentic look, but it’s not the be all and end all of wearing clip in hair extensions. Whatever the texture of your natural growth hair, you’ll have to do some work to make it blend with deep waves – this is easier if your hair has small curls. As you’ll comb through the deep waves hair extensions, you’ll notice that the waves soften and it’s easier to blend your natural hair texture by using wave perm rods and heat styling tools. As expected, deep wave clip in hair extensions are available as single wefts which can be as narrow as 1 inch and are usually worn at the sides of the head. Multi sets usually have a minimum of seven wefts of varying widths and can have as many as 12 wefts per set but there are also sets with fewer than seven wefts and sets with more than 12. Single wefts (and multi width sets) also come in different weights (thicknesses). The larger clips are often available in different thicknesses (weights), so instead of buying a single 9” piece that weighs 100g you can buy a 9” piece that weighs about 40g and you can check out images of this here. 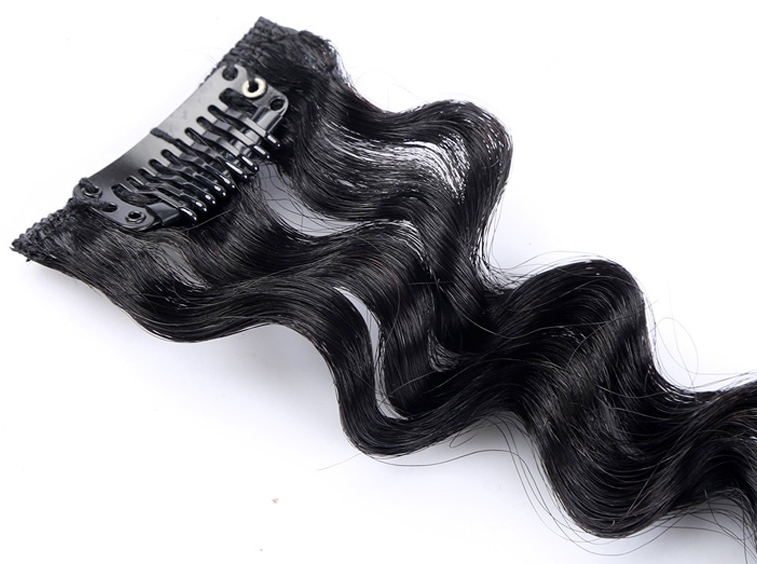 Clip in hair scholars (or neophytes who’ve read any of our other articles on clip in hair extension textures) will by now know that lengths for deep wave clip hair extensions range from 8 to 28 inches. Scholarly members of the Clip In Hair Extension Wearing Community will also know that longer lengths are available but you’ll have to get your longer-length-clip-in-hair-extension detector and using slow sweeping motions, wave it over the internet to find them. Deep wave clip in hair extensions are presented in a wealth of colours from black through to blonde. If non-naturally occurring hair colours are more your thing (and why should they not be?) then you’ll be delighted to know that there are also pastels, greens, blues, tricolours, reds and many others – hoorah! If you’re unsure which hair colours complement your skin tone, check out our guide to hair extension colours and skin tones. Why not peruse Peruke’s Caring For Clip In Hair Extensions Guide and cast your eyes over five tips to keep your deep wave clip hair extensions in super-duper condition. 1. As the deep wave texture has been set permanently set, use a leave-in conditioner or deep condition after washing with a shampoo for chemically treated hair. 2. Limit the use of heat straightening tools as frequent use can permanently distort the wave pattern. 3. Moisturise the hair regularly with a water-based moisturizer (free from mineral oils) and use hair oils on damp hair. 4. Always detangle hair before washing and at the end of washing. 5. Dry the hair in an upright position so the waves can reshape and return. That's the dart through deep wave clip hair extensions done and dusted! If you’re hankering for more info, check the Hair Extensions Q&A section or keep up to speed with articles about wigs, hairpieces, clip hair extensions and hair weave by joining our blog.